Warning: inane whine ahead. I’m preparing my 2014 tax return (yes, I know I’m late, so spare the judgment, please. I don’t owe any tax, the Canadian government owes me money) and I’m using the H&R Block online tax software, like I always do. Except it’s not working and I’m about ready to put my fist through a wall. My tax return is super easy and uncomplicated and should take less than an hour. Instead, I have been trying to get it done for the past two freaking days because their system is apparently completely broken and is registering errors based on information that isn’t even there and won’t let me access my return until I resolve these unresolvable errors. I’ve tried deleting and restarting my application several times, erasing my browser history, using different browsers, nothing works. I finally called their customer service line today and got absolutely no help. The customer service rep basically said “I have no idea why this is happening, sorry” and had no useful advice. The only thing she could offer was to try Internet Explorer but I can’t do that because I have a Mac and I don’t know anyone who has a PC that I can borrow. The system is registering that I’ve indicated I need to fill out forms that I have not checked off and won’t let me proceed until I supply information I do not have. Entering “0” doesn’t help. There seems to be no way to fix this bug. So now I have to download all the tax forms from the CRA website and do everything by hand. And I’m feeling quite (disproportionately) ragey about it. 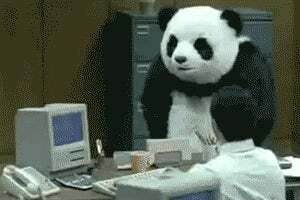 This panda is basically me right now. Ahem. This might have something to do with the fact that my period is due tomorrow. How’s everyone else’s Thursday going?